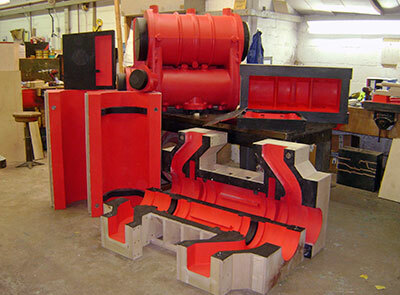 The contract for procurement of axles and tyres for the driving wheels together with all the relevant machining and fitting work including crankpins has been placed with South Devon Railway Engineering Ltd. Once the wheels have been cast and quality tested at The Boro' Foundry they will move on to Buckfastleigh. The patterns for the underkeeps of the driving wheel axleboxes have been made and work is about to commence on the patterns for the axleboxes themselves. Work continues on the spring brackets although there is much to do to arrive at the finished article. 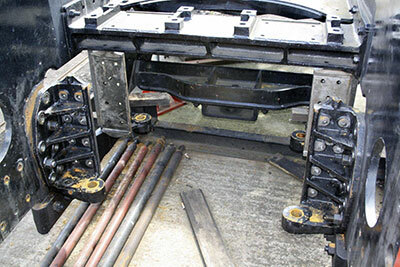 Hot riveting has commenced at the front half of the chassis and fitting work continues on the horn guides. 3. Two Freedom of the Line tickets, Mr M Williams, Bridgnorth. 5. M&S Gift Voucher. Mr J B Stevens, Coventry. 6. M&S Gift Voucher. Mr A Daze, Bridgnorth. 11. 82045 gifts, Mr Bryan Clarke, Bridgnorth. 12. 82045 gifts, Dr. Hall, Ludlow. We are grateful to Mr John Lewis and his wife Linda of Bridgnorth for helping with the draw this year. The Trust's Third Annual General Meeting was held at Kidderminster Railway Museum on 6th April. As in previous years, it was an upbeat, pleasant occasion and was attended by over sixty people. Chris was once again able to report that we had achieved the targets set out at the 2012 AGM. Plans for the next twelve months were outlined, the main drift of which is to work towards achieving a rolling chassis as soon as possible. Once all aspects of the wheeling process are on the home straight, it is intended to launch an all-out appeal for the boiler, hopefully in the autumn of 2014. After some quiet work in the background, we are delighted to announce that the Trust has been registered for value added tax. The implications of this are really huge: not only can we now claim back the VAT incurred in the four years to the date of registration, but we will be able to do so for all future expenditure on 82045. To give you some idea of the scope of this, it will represent a saving of well over £16,000 on the driving wheels (casting and final assembly) alone. As funds were already in reserve for the complete job including VAT, the portion intended for tax can now be used constructively. As a non-profit-making concern, we have always regarded VAT as a millstone round our neck, so let's give three resounding cheers as it sinks into the depths! 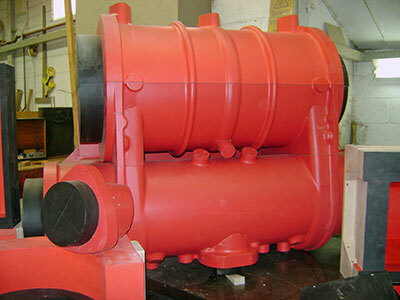 In respect of the boiler, the saving will be of the order of £60-70,000 at a rough estimate. Chris is due to meet Alan Brighouse and Des Ainsworth in Chester in mid-May to work out how much back payment is already due to us. What a pleasant exercise! Very many thanks to Paul Seton FCA, our independent examiner, who made the application on our behalf; to our Treasurer Alan Brighouse ACMA, who worked closely with Paul to bring about this great result; and to Assistant Publicity Officer and former 70A fireman Paul Anderson for introducing us to Paul in the first place. The horn guides for the trailing axle bolted in position. 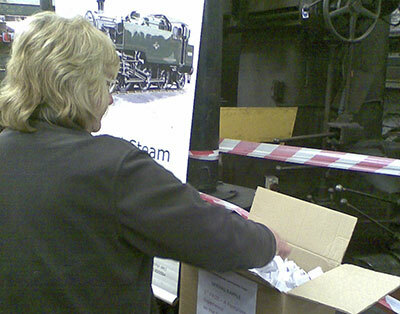 Two photos show the patterns for the cylinders taken by Steve Meech of Cerdic Foundries Ltd.
Linda Lewis pictured picking a winner for the spring raffle.